Melt it in a grilled cheese sandwich and you're likely to be labeled a culinary Ninja. Perfect for all-around grating, cooking and melting. It has a creamy, smooth texture and a slightly acidic taste. Nuances of sweetness are balanced with a rich buttery tang. 1. Place chicken between 2 large sheets plastic wrap; pound with mallet or heavy pan to flatten to even 1/2-inch thickness. 2. In medium bowl, whisk together oil, lemon juice, rosemary, garlic, salt and pepper; add chicken, turning to coat. Cover and refrigerate for about 1 hour. 3. Prepare hot fire in charcoal grill or preheat gas grill to high. Remove chicken from marinade, shaking off excess. Grill until browned on outside and cooked thorough to center, 2 to 3 minutes per side. Toward end of cooking time, top each breast with slice of ham and cheese; cover with grill lid or foil until cheese is melted, about 2 minutes longer. 4. Serve on buns with bed of romaine leaves (toast buns on grill if desired). Yes, I would buy the product again. Cut for snacks, to get the most flavor. Serve at room temp. I love cheese and sense I was diagnosed with intolerance to lactose, I haven't been able to eat cheese like before. But now with products from Dakin Farm I can enjoy again. I am a lactose intolerance and this delicious cheese I can eat as much I want it to. Ive been eating this cheese for years. I used to buy in stores but moved so I order online (which is awesome) Its very creamy and melts very well. I use it for pizza's, spaghetti, nachos, and many other things. 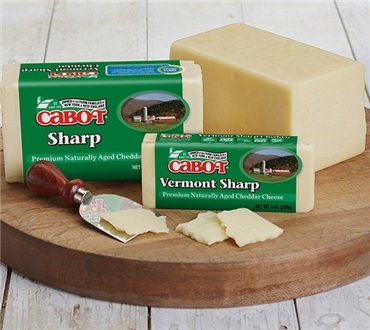 It was hard finding a cheese that melts and tastes good until I found Cabot. I would definately recommend this product. I also buy the shredded cheese.